As we continue to work with great companies that share our passion for making the lives of developers easier, we’re excited to announce our partnership with Nitrous.IO. Nitrous.IO is a lightning fast cloud-based development environment platform with a web-based IDE and cloud VMs. Supported environments include Ruby, Python, Node.js, Go, and PHP. Nitrous.IO makes it super easy to code from your local machine or any modern browser and collaborate with colleagues around the world seamlessly. Nitrous.IO’s clean design and extremely fast responsive UI comes bundled with all the tools you need to dive in and start coding. Their platform allows you to create a “box” to run servers and then test your app live from their environment. And it comes fully loaded with all the features that are useful to replace your local environment. With our partnership, Nitrous.IO developers will now be able to easily build email deliverability and alerts into their applications without needing to set up and manage their own SMTP servers or worry about delivery rates, spam folders, ISP blacklists, or scaling to meet high user volume. Developers can sign up with a free SendGrid account and set up a free cloud development environment in 60 seconds with a Nitrous.IO account. 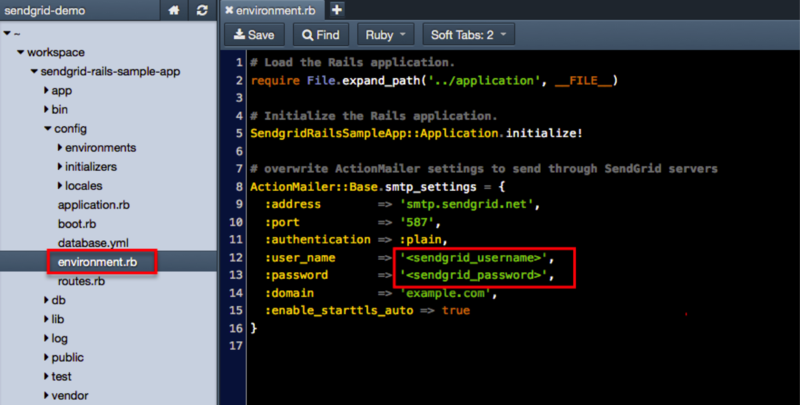 We’ve created a simple tutorial to show you how to integrate SendGrid in a Ruby on Rails app being built on Nitrous.IO. And as you get started with Nitrous.IO, be sure to check out this great article: 5 Things You Can Do On Nitrous.IO That You Might Not Know. Using a sample app on GitHub, this tutorial will show you how to integrate SendGrid in a Ruby on Rails app being built on Nitrous.IO. 1) If you don’t already have one, create a SendGrid account and a Nitrous.IO account. 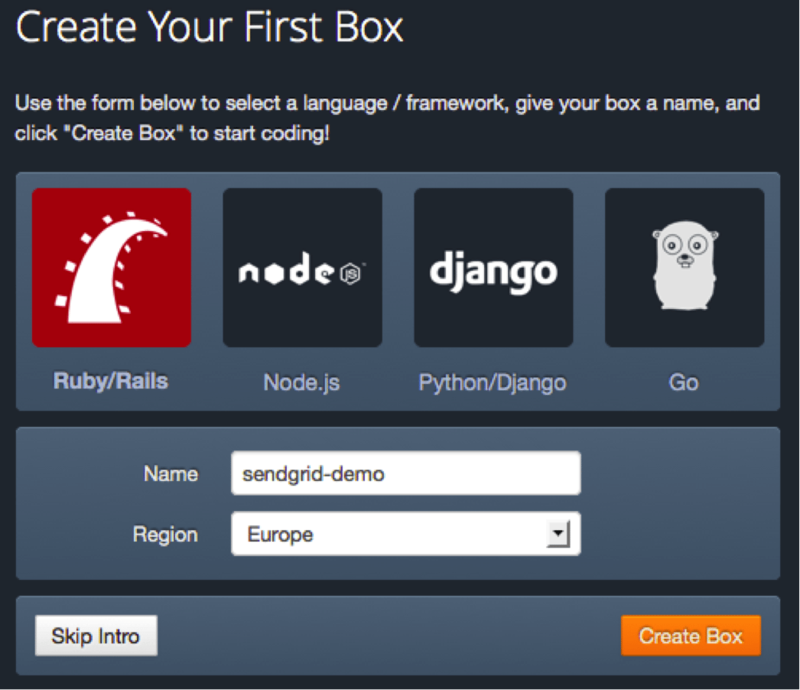 2) From the Nitrous.IO New Boxes Page, create a new box using Ruby/Rails. 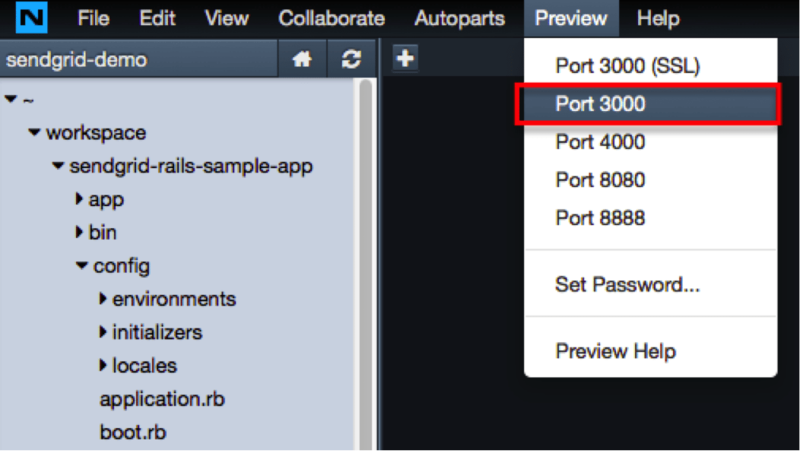 3) Launch the IDE and go to the workspace folder in the Nitrous.IO terminal console. 5) In the Nitrous.IO file browser, open config/environment.rb and change the username/password data within ActionMailer to be your SendGrid credentials. 8) Now go to the Nitrous.IO Preview menu and select Port 3000 and the sample application will be opened in your browser. 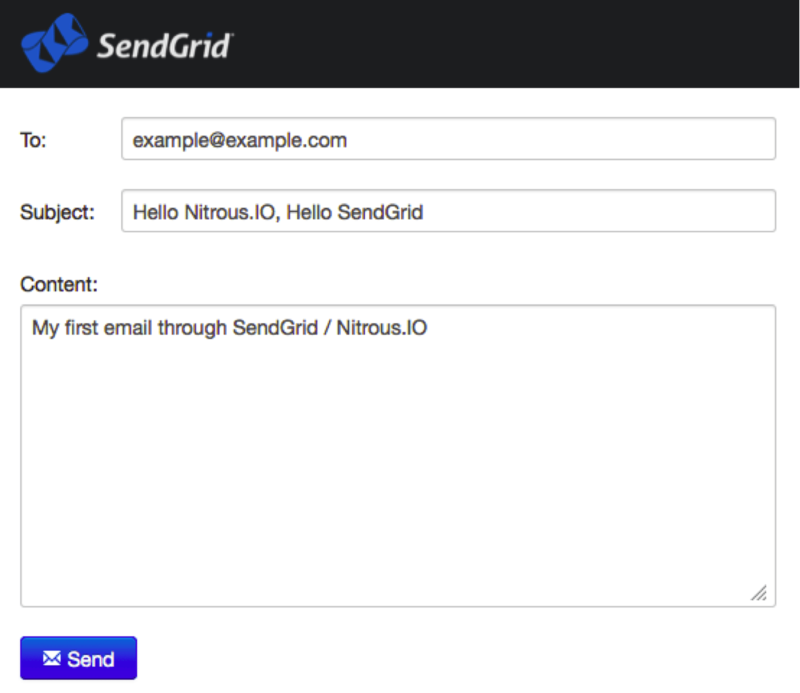 9) Send your first email through SendGrid/Nitrous.IO by filling out the form. Now go check your email. Your message will be there, waiting for you. This basic application shows you how simple it is to incorporate SendGrid email into your application. The code is also simple and is based on Rails ActionMailer. You can send the email using code in the controller app/controllers/email_controller.rb and app/mailers/sendgrid_mailer.rb contains the mailer settings. As a next step, you can build email into your own Rails application on Nitrous.IO. Perhaps you need to send social notifications, for example. Getting started is simple. Sign up with a free SendGrid account and claim your free cloud dev environment in 60 seconds with a Nitrous.IO account.